Welcome to my second installment of “Rider Review”. Today we are going to take a look at the Tour Master Overpant. My Tour Master Overpants. A little dirty from yesterdays ride. I purchased these pants back in the winter of 2008, at the same time I purchased my Cortech Scarab Winter Gloves and 4-season riding jacket for winter use. To save you the trouble of having to read the whole “why” part of this article, if you have not yet read the Cortech Scarab Winter Glove review, then just click on it there, and it will take you right to the page. Now that everyone is caught up on the back story, lets take a look at what I had for a choice, and how I came to purchase these. My other choice, of overpant that was in stock at Eastside Motosport’s was the First Gear HT Overpant. Side by side comparison of these two left me with 2 things seperating them. First of all, the HT had a pant liner. This would be a nice addition for those “Much Cooler” days, but was not something entirely needed. With proper layering, a standard overpant would suffice, just so long as it kept the wind chill at bay. The other thing I noticed, was that the Tour Master pants had vents. Now, this is something that I thought of, as it would make for a nice summer pant as well if it was properly vented. The HT did not have vents. My main concerns was that it would provide proper wind protection and that it would be water resistant. Both pants offered this. The other deciding factor was that the FirstGear HT Overpant was an additional $50 dollar premium, and since I was on a budget, this factored into my final decision as well. So, as the review suggests, I purchased the Tour Master Overpant. A back view of the pants. Now, unlike my Cortech Scarab Winter Gloves, the pants I wear year round. They did not get sat in the corner during the spring and summer, due to them being to0 warm. No, these worked out marvelous. As I mentioned above, layering is easy enough with these. They are extremely baggy to offer room. I was easily able to wear any selection of pants and layers underneath to provide adequate protection for whatever ride I planned. Either my commute to work, or out and about. Secondly, as it began to warm, the removal of layers, and eventually the ability to open up the zippers to the vents provided year round climate control. The pant worked well in that department. I also really like the full length leg zippers. The ability to unzip them to the waist makes them extremely easy to put on and take off with boots on. The reflective piping on the front of the pants is extremely noticeable during the night time hours, and the weight and feel of them is extremely manageable. Water resistance is what can be expected from any heavy textile. It is only as good as the product you put on it. And keeping product on is always a concern. The stretch panel located in the crotch of them is a little bit more susceptible to moisture, and the “Wet Pants” effect can happen easy enough if you do not keep them treated often. A liberal application of Obenaufs Watershield or Nikwax TX Direct Spray-on will help keep your pants in top shape. Now, one thing to note, all because something is water resistant, does not necessarily mean it is water proof. These will work adequate in your standard drizzle, and short spurts of heavy rainfall. They will not however keep you 100% dry in continued exposure to heavy rains. This was made readily apparent during the New Years ride I attended which you can read about here in “Across the Sound: Destination – The 12th Annual New Years Day Ride“. Again, I’m not going to bore you with a recap for those of you who already read it. For those who didn’t, you can either read that above, or read this quick summary. We got wet… Very, very wet. Nobody’s gear held up. Although the vents are supplied with water resistant zippers, the pockets are not. This gives water an easy way in to wet the contents of your pockets. Now there are some very interesting design issues I have with the pants, now that I have ridden in them for a year. For starters is the zippers on the pants don’t really make much sense. The vent zippers are water resistant zippers, which is an absolutely must to have on any clothing advertised as water resistant. The pockets, however are not. They sport standard zippers, allowing for the rain water to make it’s way into them and wet the contents of your pockets. I am not certain as to why they would actually do this, and deserves to be considered a minor inconvenience if not major in some instances. I keep my wallet in my overpant pocket, it makes it easy to get to when needed for fuel, store stop, or heaven forbid, get pulled over by an officer of the law (which, I actually was while wearing these pants last May). Overall, I consider this to be a pretty major design flaw in the pant, and would like to see them update this with a water resistant zipper in future design changes to this pant. My other major complaint about the zippers is the quality of zippers. I am, still to this day, absolutely amazed at what motorcycle gear manufactures use for zippers. To me, there is only one choice when it comes to zippers, and that is solid brass zippers. However, it seems as if manufactures do not find zippers to be worth spending the extra dollar or two on. With the minor cost a good zipper is, it still amazes me how very few manufactures actually use heavy duty brass zippers. Alpinestar’s likes to use junk plastic ones, and these Tour Master’s are no exception for the junk zippers they use. The zippers are a cheap pot metal, that finally after a years worth of use, the main pant zipper finally gave out. And we are not talking about bending out of shape and coming apart, it basically just crumbled to pieces as I was zipping them up. This is another area of the pant that could be easily updated. A heavy duty brass zipper, and a small velcro flap would allow this area to be better protected, as well as more functional. Because the zipper is not of the water resistant kind, and there is no protective flap, water can seep in, and gather in the folds here. It’s another one of those design flaws you notice only after wearing them for long periods of time. When I have the zipper fixed by a local tailor, I will see if I can have a couple other changes made. One, I would like to see the zipper attacked to a stretch material itself. With all of the ways to cinch these up, this would make zipping up easier. Secondly, I want to see if they could add a flap that is secured down by velcro to cover the zipper from the elements. This little change should be able to help with the wet pants effect. Everything else in this area is suitable however. As you can see from the pictures, they have plenty of extra material to open up, allowing for the ease of putting on and taking off. This feature added with the full length zippers found in the legs makes this pant extremely easy to put on and take off. I did find some stitching start to go in the crotch, where the stretch material is sewn to the rest of the heavy textile. This is an area that one would need to keep an eye on, and have fixed accordingly. The size cinch straps are very nice for adjusting the pants, and with them being velcro, makes cinching fast and easy, allowing you to adjust easily when taking off and putting on. Again, another feature that makes taking off, as well as putting on these pants quick and painless. The stretch material in the waist is starting to show wear. An issue that recently came up, as seen in the picture to the right, is that the material around the clasps for the straps has started to show signs of wear. The stretch material, seems to be coming undone from the rest of the pant. At first, I thought this was caused by over-cinching the pant, but I think it is just from the repeated process of putting on and taking off this pant. A good suggestion to Tour Master for this section of the pant would be to use the same heavy material they use on the backside of the pant where the jacket attachment zipper is located, and in the knees. Which brings me to a rather weird observation. This pant uses a lot of different stretch materials, when it could simplify. It seems the crotch and waist are 2 different styles, and the knee’s and below the zipper attachment is another material. They could have simplified it with only 2 types. One for the crotch, and then utilize the same materials across for the waist, knee’s and the location below the zipper. So through this whole review, it seems I have a lot of negative to say about this pant, and not much positive. The truth is, there is a lot of negative. There is a lot of wear that I would not have expected this early in the life of this pant. Although the pant has been used year round, in all 4 seasons and adverse weather, the wear that is seen is not something you would expect. The shell of the pant is holding up fine however, and the items that are giving way, should be easy enough for a competent tailor to repair and modify. I will be having some changes done to these, and I will come back around and update this review with those changes and photo’s. And this being a rolling review, we will get to see down the road how those changes effect the outcome of this pant. Satisfaction is not very high with this pant. 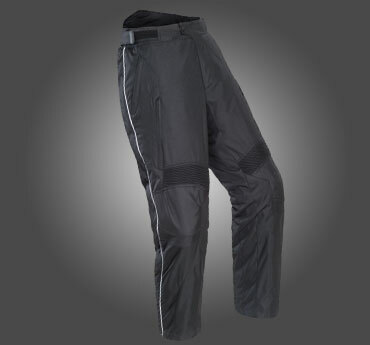 It has performed great in some area’s like ease of dressing with them, and the vents are a welcome bonus for year round riding, but the small area’s that it needs in refinement, are pretty big issues to be considered a competent 4-season or even 3-season pant in the Pacific Northwest. With the recent changes in other clothing lines, there is a good number of different overpants to choose from now. So I would not be seeing myself purchasing these again. I would rather spend the extra 20 to 40 dollars for a much better designed pant. But for the time being, I will continue to wear this pant. So not wanting to purchase these myself, I can’t say I could recommend them to a friend. Unless they were seriously in need of a pant under 150 dollars. But even now, FirstGear and Fieldsheer both have some nice clearance items worth taking advantage of.